Cheltenham College first came to us for advice on how they could improve the sound for live performances within their main school hall. 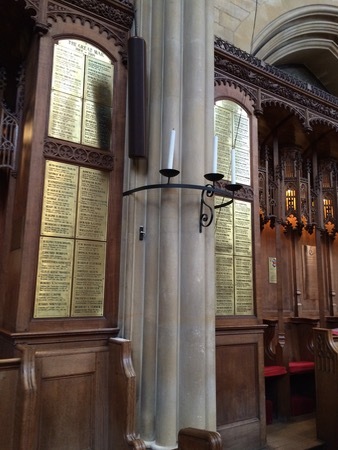 The main school hall at Cheltenham College is a classic large space with a 8m high ceiling, wood panelling on the walls and a solid wooden floor resulting in a large reverb time that makes it difficult to get a clear sound especially with singing and speech. Their existing system comprised of an old pair of full range speakers mounted either side of the proscenium arch which provided the entire audience with the sound. Like many halls of this size (approx 18m wide by 30m long) the sound tended to be too loud for those near the front whilst too quiet and lacking clarity at the back. With this type of issue one should always see if acoustic treatment can be applied to the structure in the form of acoustic panels or large drapes but they were not keen on this as it was felt it would spoil the aesthetics of the room. The solution we chose was to install higher quality speakers again either side of the proscenium arch but lower down so the distance to the audience was shorter and then a smaller pair of speakers half way down the hall. We chose Martin Audio XD 12′s for the main sound and Martin F10+ speakers for further back with the sound delayed to these so that it was in phase with the sound coming from the front speakers. By doing this we were able to run all the speakers at an overall lower volume as the front pair didn’t need to project the sound as far. This in turn meant that there was less reflection of sound taking place in the room resulting in a much clearer and more even coverage of sound. We also updated the old analogue mixer and outboard processing equipment for a new Allen & Heath Qu32 digital desk that had powerful EQ enabling accurate feed back elimination of the mics to be programmed and stored for the different set up’s they use. The in built graphic equalisers were also utilised to optimise the sound of the speakers and this was also stored within the desk. 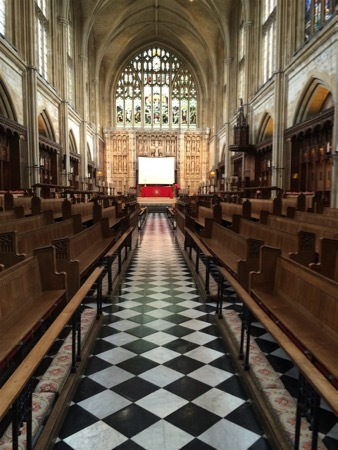 The stunning chapel at Cheltenham College can seat over 700 and is considered to be the heart of the college and is used daily for services and concerts. The existing column speakers were poor quality and the result was a muddy and uneven sound which often fed back when turned to a reasonable volume. To improve the sound we had to look at all the elements in the signal path starting with the mics then the mixer and finally the amp and speakers. Starting with the radio mics we provided Sennheiser systems with top of the range DPA mic capsules which instantly increased both the volume and clarity when speaking. When using lapel mics especially in reverberant or noisy environments it’s often difficult to get a decent level of the person speaking due to the position of the mic. The solution is to either run the overall system at a lower volume or select a very high quality lapel mic capsule and that has excellent gain before feedback and utilise this within your mic setup. DPA are considered to be the world leaders in lapel and head worn mics and by using these with the Sennheiser belt packs we were able to double our volume before feedback. The old mixer was a budget Mackie model which had limited EQ and did not enable volume and EQ settings to be programmed and stored. Like the main hall we opted for an Allen & Heath digital QU16 which we then programmed scenes with equalisation & volume templates for all the different range of mics that they use (lapel worn, head worn, handheld and lectern mounted). Whilst all of the above made a big improvement the most noticable change came when we replaced the existing budget column speakers. Having looked at numerous makes and models the one we went for was the Tannoy VLS15. This speaker is designed to deliver clear speech reproduction even in difficult acoustic environments and the difference when we installed them was very noticable. They also have various volume settings on the back so the although they are all linked together they can be set to the appropriate volume for their particular coverage area. Their build quality is excellent and when we had them painted to match the dark wood of the pews they blended in perfectly. Overall the project was very satisfying and the results have enabled the college to deliver greater clarity and coverage for music performances and presentations in both the main hall and the chapel.